What started as a double-house design for two generations, ended up as this modest house, balancing traditional and contemporary architecture. When architect László Földes received the first phone call from his new clients, they asked him quite an original question. They were not only looking for an architect who could design their house, they were also looking for someone who could find the right plot to build the house on. 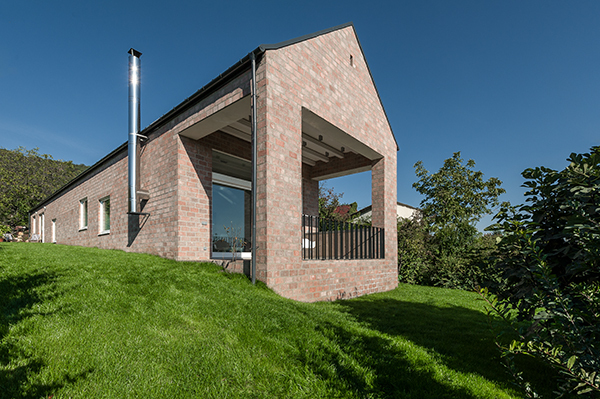 Thus László Földes spent several weekends in the countryside finding the right building plot. Fortuitously, they came across a beautiful green building site with a long, narrow shape in the village of Pilisborosjenő, a mere 15 kilometres to the northwest of Budapest. Everyone involved liked the natural site from the very beginning.